This artisan design 16×16 inch Despicable Me pillow is all about Minion Jerry. While Dave, Kevin and Stuart seem to have the limelight, happy little Jerry can use some love too! With his two big brown eyes and the adorable little space between his front teeth, Jerry is the Minion appearing in Despicable Me 2. He is the super sensitive Minion who often gets teased by Kevin for being a coward and who is often easily scared much to the amusement of the other Minions. Jerry is the muscially talented Minion who plays the guitar. While attempting to play golf with Kevin and after singing the girls a lullaby, Jerry is abducted by El Macho when he and Kevin go outside to investigate a noise they hear. Minion Jerry has just recently (May 2015) made his debut in the Minion Rush mobile action video game. Measuring 16×16-inches, this artist designed pillow comes with a washable poplin cover and features a concealed, durable nylon zipper so you can remove the cover for cleaning. Inside is a hypo-allergenic, down alternative insert — double stitched for quality and overfilled for loft and comfort. Detailing in this dimensional design is crisp and clean. Colors are in yellow, brown, gray, white, black and peach making this bright addition to any room. The pillow cover is made from a tightly woven, strong 100 percent spun polyester poplin fabric and is meticulously hand cut and sewn. To clean, just remove the cover from the pillow and pre-treat any stained or soiled areas with a color-safe spot cleaner or spray. You may also use a damp sponge to remove stains. 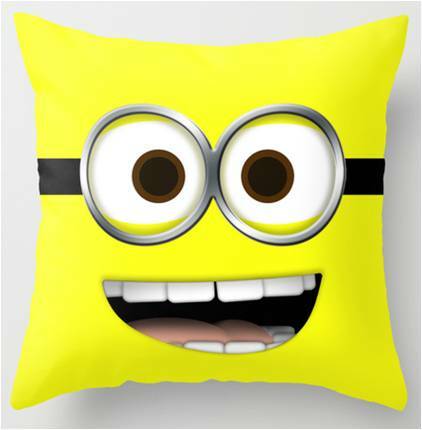 This Minion pillow is machine washable in cold or warm water using a mild detergent. Do not use bleach as this can degrade and yellow polyester poplin fabric fibers. Allow the cover to air dry or tumble dry on a low setting. Because this is a premium design, it is not available in any big box retailer and is only available to buy online. It can be purchased in 16×16-inch, 18×18-inch and 20×20-inch sizes. Other themed decor in this design, includes rugs, tote bags, shower curtains, mugs and duvet covers, all available through the link below. This pillow may be ordered either WITH or WITHOUT the down alternative insert. Order this as a PILLOW COVER ONLY if you have any existing pillows that can use a new look. Fabric is available as indoor or outdoor with the outdoor option costing a few dollars more. As a premium Despicable Me merchandise option, it is made to order in the USA and ships to buyers in 3 to 5 business days. Pricing will be based on the product you select and has not been determined by our website.